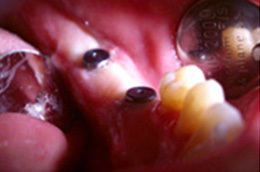 Implants are one way of replacing missing teeth. A titanium post is planted in the jaw bone to support a replacement tooth. This acts like the root of a natural tooth. 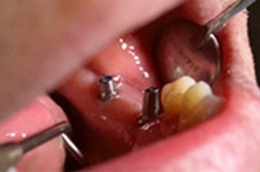 Implants can also be used to support fixed bridges or dentures. First, you should decide whether implants could be right for you. Ask your dentist about the stages of treatment, about who would be carrying out each stage and the timetable for completing treatment. 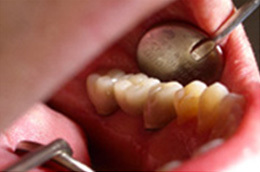 Your dentist will carry out a thorough assessment of your suitability for implant therapy. An appropriate plan will then be made. Occasionally due to medical conditions, lifestyle choices or the local anatomy implants may not be the right solution for you. Implants are placed in the jawbone painlessly under local anaesthetic. 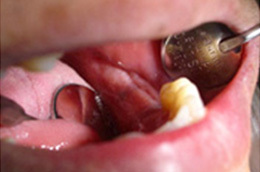 This is very skilled surgery but as a patient very much like routine dentistry. Most procedures take about an hour. Implants are left undisturbed for several weeks. This allows time for the bone to fuse to the titanium in a process called osseo-integration. Impressions are taken of the implants and the replacement teeth are constructed as crowns, bridges or dentures and then fitted to your mouth. The whole process usually takes 10-12 weeks from start to finish. Contact us for more information. We’re happy to answer any questions you may have. Contact our practice to book a dental implant consultation and find out if dental implants could work for you.